Jessying - Malaysia Beauty Blog - Skin Care reviews, Make Up reviews and latest beauty news in town! 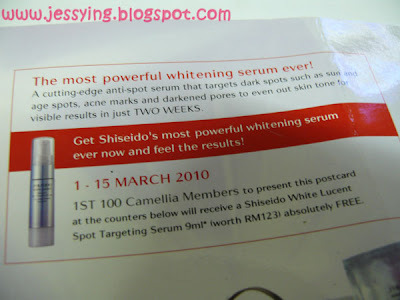 : Shiseido Camellia member got RM123 worth serum! Shiseido Camellia member got RM123 worth serum! 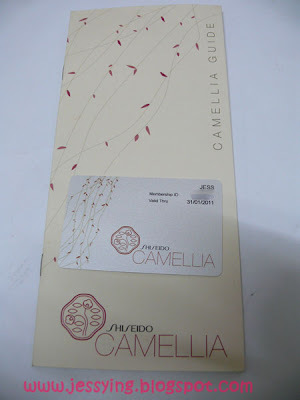 I received my Shiseido Camellia member card 2 weeks ago and its so pretty and classy ! 1st 100 Camellia members to present this postcard at the counters below will receive a Shiseido White Lucent Spot Targetting Serum 9ml (worth RM123) absolutely FREE!!! 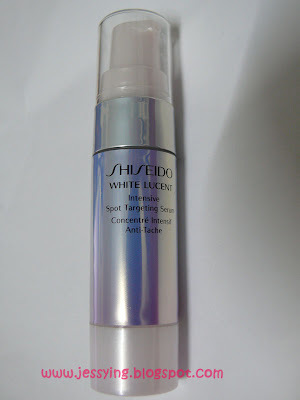 Shiseido claimed this is the most powerful whitening serum !! So quickly I brought my card and postcard to claim it from Shiseido Parkson Pavilion counter. Its 9ml !!!!! 30% of its full size! 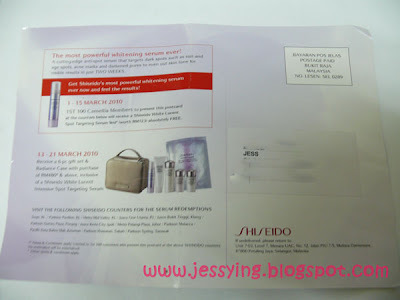 So generous of Shiseido to reward their customers (especially new customers!! ), I am going to try this out ! p/s : I was the first one to claim from the Parksons Pavilion counter( damn kiasu right?) Anyway hurry up and redeem your freebie when you receive your postcard, however always advisable to called them first before going there to avoid disappointment. wow ~~~ it's so great ! Ya I heard this serum is really powerful and It absorbs faster than the Estee Lauder new brightening serum ! 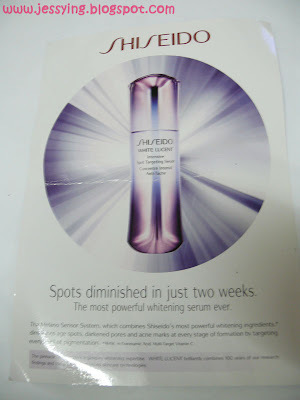 Shiseido gave me this serum sample to try too!! i love tis 1~~i try and it was totally NICE!!!! Yjia : Is it ! Let me try, after finishing my current serum! But this Shiseido serum is freaking expensive !!!! Better works well! Pigita : Yeh pandai lah you !!! They know how to make customers happy! susanchu: I received this postcard 2 weeks plus ago,and I was told by one of the readers that not all members will receive the postcard, only selected one. Maybe you can call HQ and asked. ya loh...quite expensive ~~~ 400 ++ oh..
Yjia : I got the Dior Essential serum from the Isetan Lucky , havent use it !! How much the Dior Essential serum in full size ? ciawwei : Try , try lo ! Was wondering if can see the result from the 9ml! The Dior Essential Serum is RM360/30ml. Are you going to the Dior workshop this Saturday ? I want to go ~ But I got two test in this Saturday >< Damn it ! test again ! why all these good things happens when I got test ?!! !